Mr Maduro made the shock revelation during a state television broadcast and has since heightened security with the pro-government militia units. 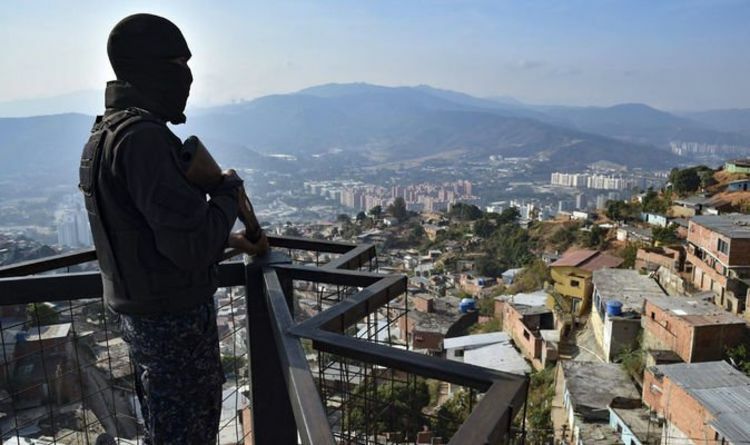 The Venezuelan dictator said: "I know about their criminal plans - those who lead the opposition - their plans to kill me.” The defiant leader added ”the country’s military units have been put on alert" with an increase in "intelligence and counterintelligence activities”. Mr Maduro defended the measures as “constitutional, legitimate and necessary” after he suggested the criminals had been “paid off” by anti-government demonstrators. In a further move to bulk-up security, Venezuela's deputy foreign minister, Ivan Gil, confirmed allied Russian forces will stay in the country and did not rule out more personnel from being deployed. Meanwhile, the Kremlin insisted the military specialists were in the region to service pre-existing contracts for the supply of Russian arms. Boots on the ground prompted the Washington to intervene, with US Secretary of State Mike Pompeo insisting it had a list of options including sanctions following the presence of Russian troops. The political crisis also took another bitter turn after Venezuelan opposition leader Juan Guaidó had his parliamentary immunity lifted, and as a result he could now face being arrested. Mr Guaidó who is the leader of the National Assembly declared himself the acting president on January 23 after the result of the election was widely disputed. The European Union has condemned the decision by the National Constituent Assembly to lift his parliamentary immunity and has called it a “serious violation of the Venezuelan constitution”. In a statement it said: "The EU rejects the decision taken by the non-recognised National Constituent Assembly to lift Juan Guaido's parliamentary immunity. “This decision constitutes a serious violation of the Venezuelan constitution, as well as of the rule of law and separation of power.